Know what Moms like? Thoughtful greeting cards. 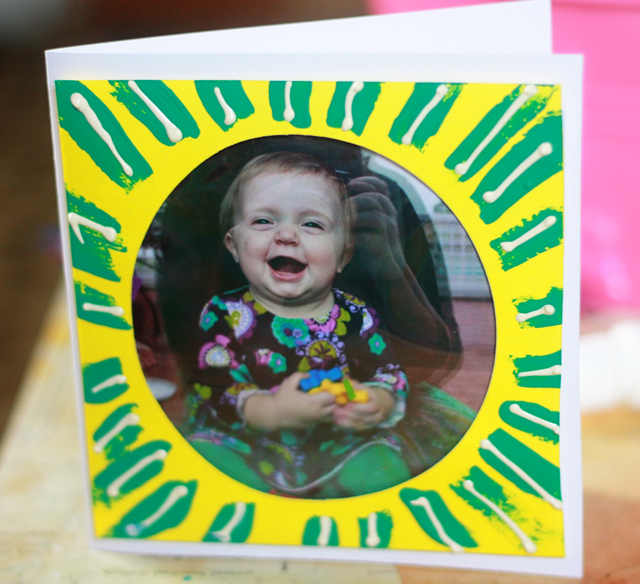 Know what Moms like even more than thoughtful greeting cards? 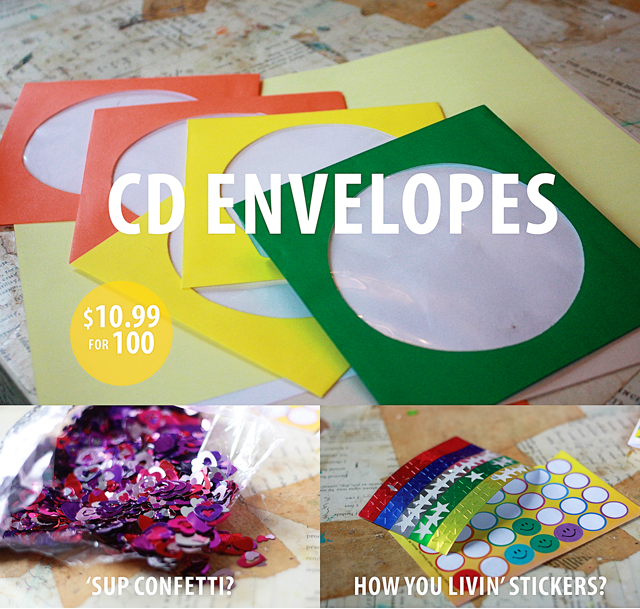 Thoughtfully homemade greeting cards. 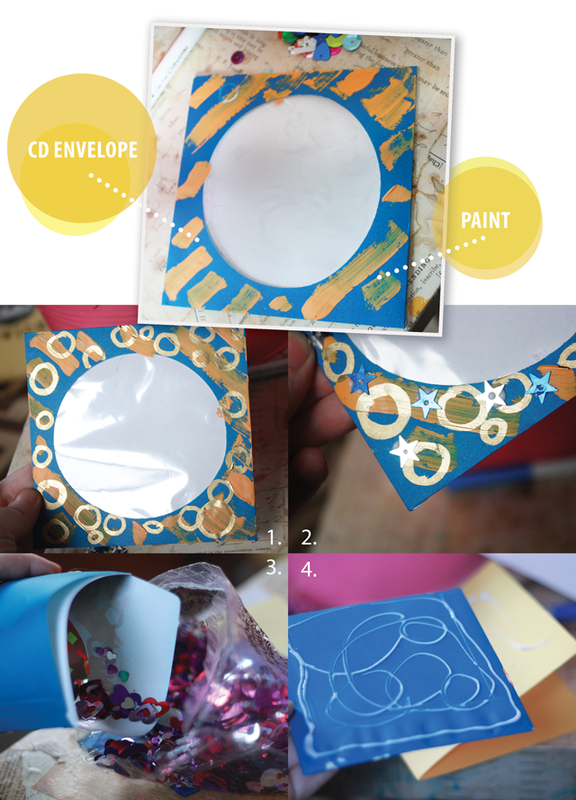 Know what Moms like even more than thoughtfully homemade greeting cards? 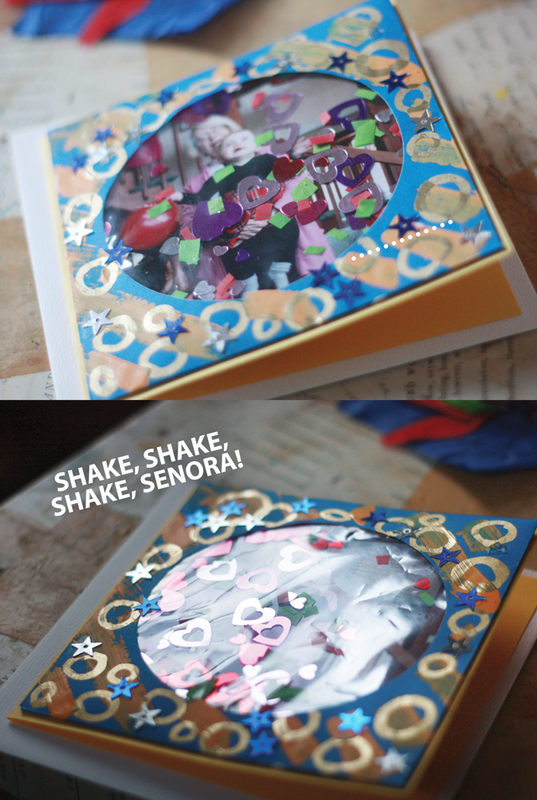 A thoughtfully homemade greeting card that reacts when you shake it that she can hang on the fridge or show it to all her friends as if to say BET YOUR KID NEVER GAVE YOU ONE AS COOL AS THIS. 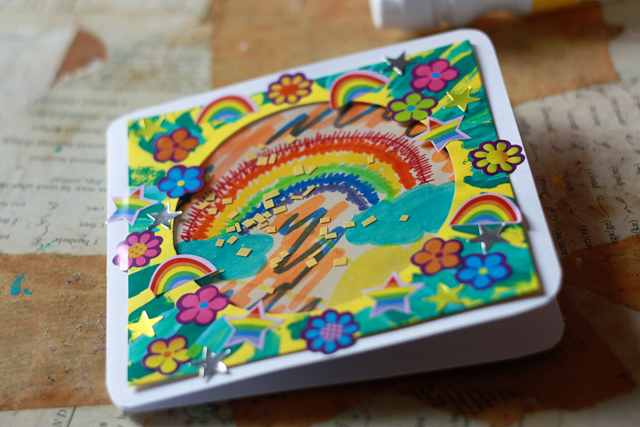 Let’s embellish the outside and add some confetti to the inside. A drawing or photograph trimmed to a 5″ square. 1. 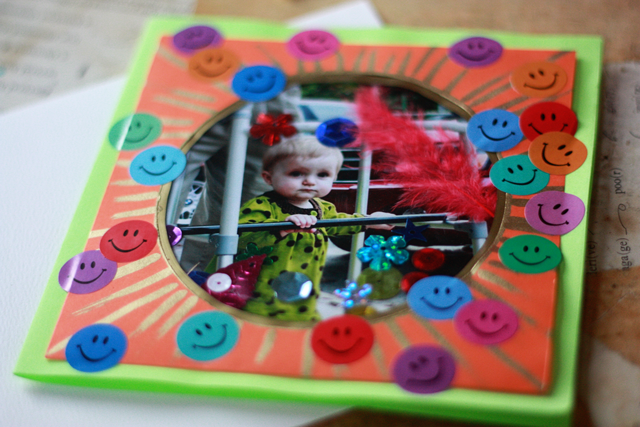 Decorate the outside of the frame with paint and a gold marker. 2. Add some sequins. Your Mom deserves some sequins, doesn’t she? 3. 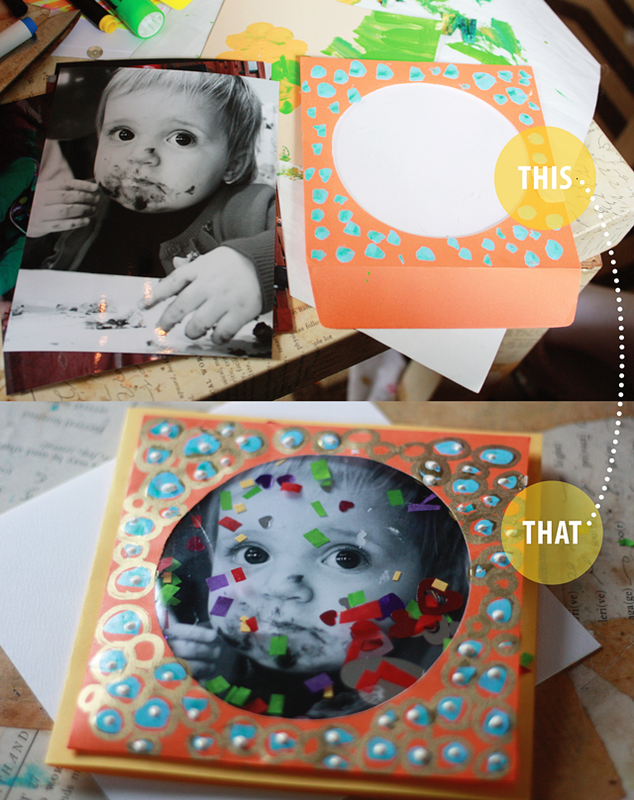 Insert your photo or drawing, then add a pinch of confetti in front of the image. It’s hard to photograph the confetti moving around in there, but trust me, it moves. And don’t worry — it’s sealed in good. No messy, exploding confetti all over your carpet, I promise. Still nervous? OK fine. Be that way. Skip the confetti. What about adding some feathers in there? 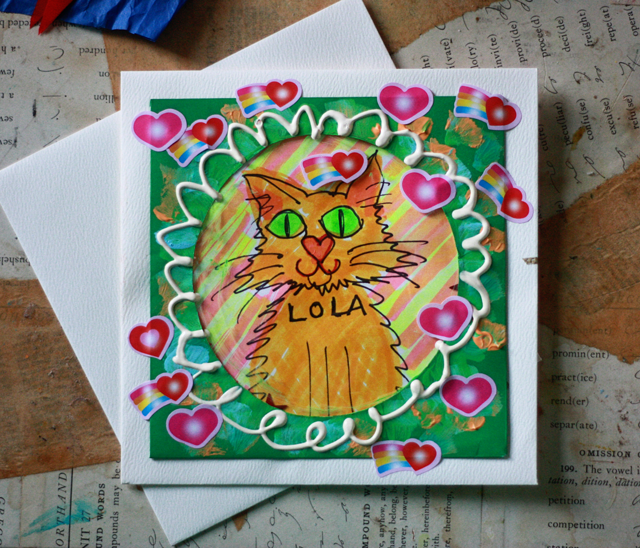 Look, Lola made one too. She loves those stickers. What? No pictures for Mom? Too insecure to draw? How about her name instead? 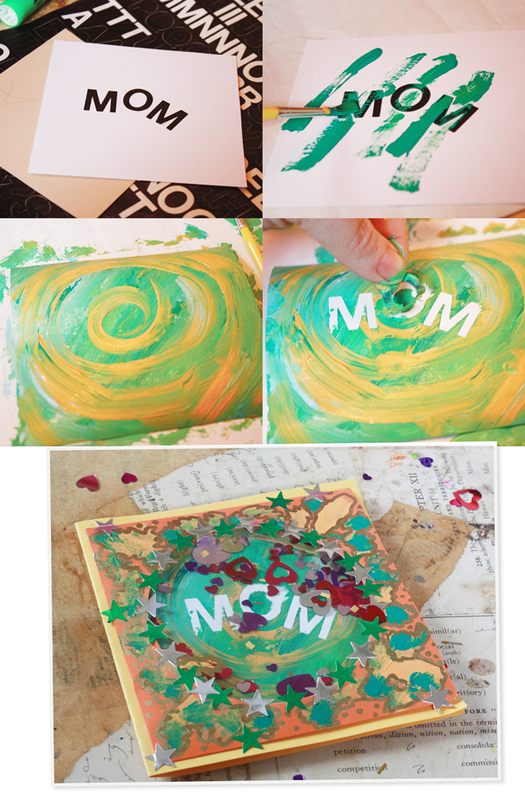 Use letter stickers to spell her name (MOM, obviously) then paint over it and remove the letters. Boom. She will love it! Super cool! I already made everything for Mother’s Day so I will save this for next year or maybe her birthday which is later in the year. Now to bug my husband to save those envelopes from software (he is IT). Thanks for sharing, Peaches. Who’s better than YOU? I’ll have to forward this to my daughter. I’m going to work on my Christmas CD in July. I need to get “my assistant” to help me figure out how to do it. Any chance you will make some of those vintage wrapping paper designs available for the labels? How about dogwood for the Friday flower?